Desperate Chinese Villagers Turn To Self-Immolation : Parallels Over the past decade, local governments have demolished millions of homes as China rushes toward urbanization. Protests against such land seizures have taken a disturbing turn recently: A 42-year-old rice farmer set himself on fire last month when authorities came to his home. There have been more than 50 such cases since 2009. 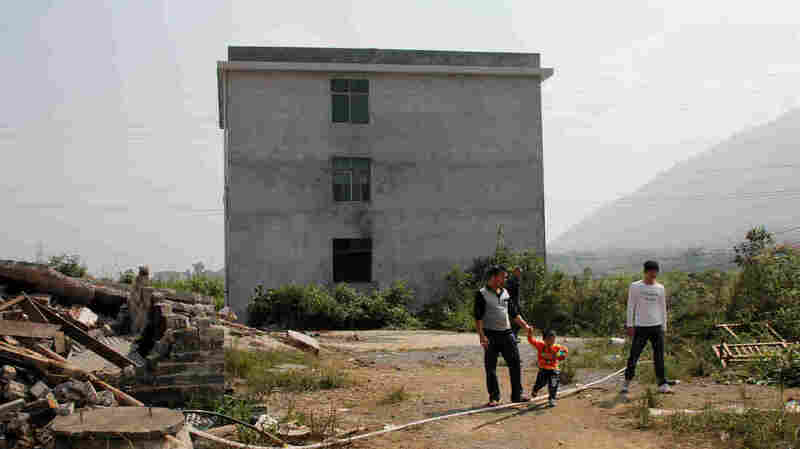 Relatives of He Mengqing walk in front of his house, which the local government has slated for demolition. The rice farmer from Chenzhou in China's Hunan province rejected a government offer of compensation for his land; he set himself on fire when officials came for him. In order to turn China into an urban nation, local governments have demolished tens of millions of homes over the past decade. Homeowners have often fought back, blocking heavy machinery and battling officials. In recent years, resistance has taken a disturbing turn: Since 2009, at least 53 people across China have lit themselves on fire to protest the destruction of their homes, according to human rights and news reports. This may conjure up images of the more than 100 Tibetans who have self-immolated over roughly the same period to oppose Chinese policies in Tibet. But this is a different problem. And while many other countries claim land in the name of development, the extent of this policy in China and the extreme response of some of those losing their homes has been striking. He's family members stand in the room where he self-immolated in late September. He's brother, Waiqing (second from left), says local officials have too much power and villagers can do nothing to stop the demolition of their homes. The most recent case of someone setting himself on fire over home demolition occurred in south-central China's Hunan province. It began late last month on a sunny Sunday morning, when dozens of officials and police arrived with a pair of excavators at the farmhouse of He Mengqing. The local government wants to level He's village to make way for a park, part of a $1.6 billion plan to bring in factories, construct apartment buildings and develop the economy of Chenzhou, a city of about half a million people. He, a 42-year-old rice farmer, refused to take the government's compensation offer of about $33,000. His farmland is his only source of income, and he figured he would need a lot more money to survive without it. So, when the officials came for him, he locked himself inside his house. As the pair of excavators ripped apart a nearby home, officials pried open He's door with a crowbar. He then poured gasoline over his head, opened a tank of cooking gas and lit himself on fire. "There were the sounds of explosions, two of them: 'Boom! Boom!' " recalls He's brother Waiqing, who tried to block police from entering the house. "Very thick smoke and fire were coming out of the window." Family members watched as He burned inside his home. A water truck pulled up and fired water through the window. Eventually, government workers carried He — his body badly burned — from the building. Waiqing says he never imagined his brother would try to kill himself, but He's sister-in-law, Li, says he couldn't afford a new house and had run out of options. One of He's shoes sits amid the ash that carpets the room where he lit himself on fire. "He is already in his 40s and has no diploma," Li says, standing in the room where her brother-in-law lit himself on fire, wearing a white hoodie that contrasts sharply with the blackened walls. 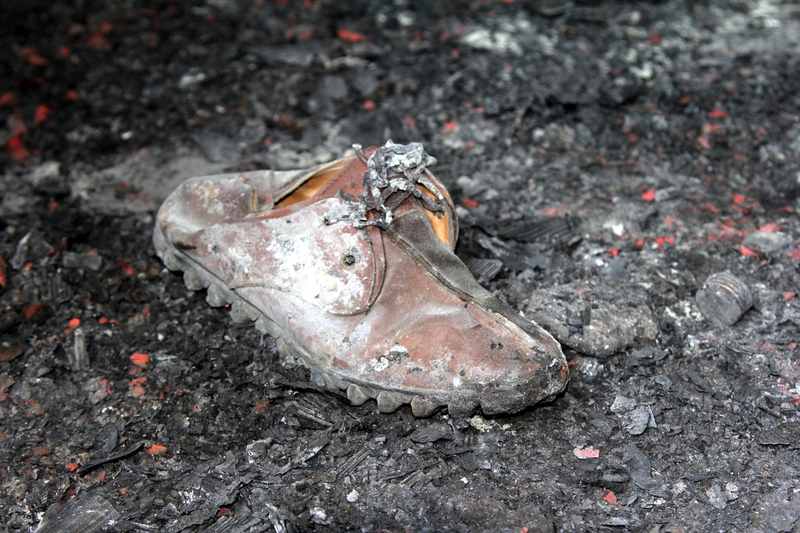 One of He's charred leather shoes sits amid the ash that carpets the floor. His 2-year-old nephew collects some of the ash with a plastic toy shovel — too young to understand what had happened to his uncle. "[He's] child and the entire family depend on him," Li continues. "He knew he couldn't find other work because he had no diploma and is growing old." "He asked, 'How can I survive in the future?' " Li recalls. "The government said: 'That's your business.' He was helpless and was forced to self-immolate." Waiqing says he warned officials that demolishing the house carried risks. "I told a government official that forced demolition would lead to someone's death," Waiqing says. "He replied, 'If someone dies because of this, the government will provide compensation and it has the money to do so.'" In self-immolation cases, governments are sometimes willing to spend large sums to compensate families for the death of their loved ones and, perhaps, shut them up in the process. That was the case with a 47-year-old woman named Zhou Lijun, who lit herself on fire in May to protest demolition of her home for redevelopment in another section of Hunan. Government officials eventually paid the family more than $570,000 to compensate for her death, her brother, Zhou Haijun, said in a phone interview. People gathered at the He family home react as He Mengqing lights himself on fire on the day his house was set to be demolished. By Chinese standards, the sum is staggering. After receiving compensation, the family members of those who have self-immolated are often much more reluctant to speak to reporters. The Chenzhou government blocked official news of He Mengqing's self-immolation. Family members say a local TV station covered the story, but it ran only once and is nowhere to be found on the station's website. They also posted videos of their scuffles with police and He's self-immolation on Chinese microblogs, but censors deleted them. In a statement to NPR, Chenzhou officials said He's house was illegal, that he demanded more than $600,000 in compensation, and that his wife urged him to light himself on fire. The statement did not express any regret. He's wife, Huang Xiaoying, denies the government's claims. Radio Free Asia, which first reported the story, interviewed an unnamed official who said the self-immolation was really just a ploy to get more money. "The common people want to get extremely rich through home demolition. They want generations to benefit," the official said in a phone interview. "That's impossible." A report last year by Amnesty International showed that at least 41 people had lit themselves on fire between January 2009 and January 2012 to protest home demolition. Corinna-Barbara Francis, Amnesty's China researcher, says they weren't driven by greed, but desperation. "I think they've come to the end of their rope," she says. "Many of them, we know, have tried to work through the system. That has failed. They've been neglected. They've been abused." 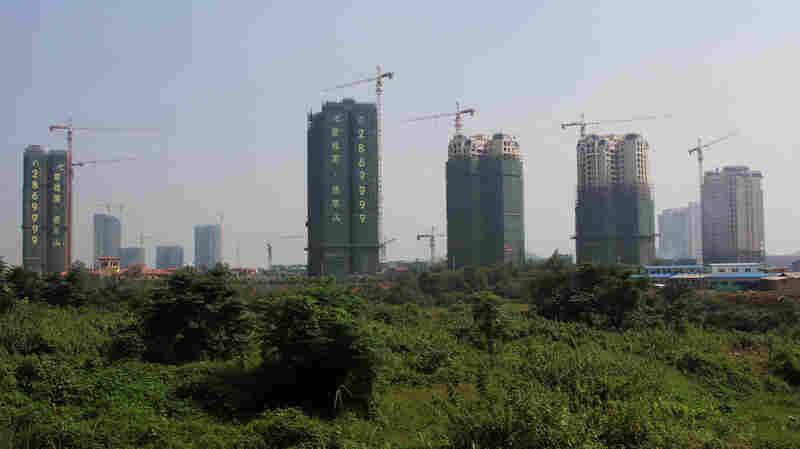 Apartment blocks rise in Chenzhou, where the government is building a new city with an industrial park to develop the economy and urbanize the area. Yan Shiming felt that way. He used to farm rice and mushrooms in Hunan province. In March 2011, construction workers came to knock down his home to make way for apartment buildings. Yan had filed administrative lawsuits, which went nowhere. He doused himself with gas. He said he felt angry and helpless. "The courts and the law are of no use to us," Yan told China's Southern Metropolis newspaper. "We went to Beijing to appeal to higher authorities for help. The police wouldn't protect us. We were taken to a local police station and beaten up by the policemen." Yan never lit himself on fire. Officials stopped him, but the level of frustration he felt toward local government is common. Perhaps no one has illustrated that frustration more graphically in recent months than Zheng Guocun. Zheng ran an animal feed store in Bei An, a city in northeast China's Heilongjiang province, a few hours by car from the Russian border. Local officials wanted to demolish Zheng's home and store to clear the way for apartment buildings. After Zheng turned down a compensation package, hired thugs dragged him from his home one night in late June and beat him while construction workers knocked down his house and store. About two weeks later, Zheng left his hospital bed one morning and went to Bei An's city hall, where citizens routinely gather to protest government policies. It's a hulking gray monolith that towers over a nearby shanty town. Zheng poured gasoline over his body and lit himself on fire. Then, according to a witness, Zheng ran toward the building and banged his head against one of the pillars, before falling to the ground. Zheng died later that afternoon. Land seizures are epidemic in rural China. More than 2 in 5 villages have had land confiscated by the government since the late 1990s, according to a 2011 report by Landesa, a rural land rights organization based in Seattle. Yu Gao, Landesa's China country director, says local governments seize farmland to make money, urbanize and develop their economies. He says land sales make up more than 40 percent of local budgets. In the first nine months of this year, 300 city governments brought in more than $300 billion from land sales, according to China Index Academy, a real estate research institute. But most farmers never receive anywhere near the market value of the land they lose. In fact, the Landesa survey found that more than 1 in 5 farmers weren't paid anything at all. One reason, Yu says, is corruption. "Unfortunately, compensation money out of land taking could easily be intercepted by local officials," Yu says. "There is a level of greed and they don't have enough empathy to the plight of the rural farmers." Government land confiscation has generated tens of thousands of protests a year in China, according to the government's own studies. Yu consults on the issue with China's ministries of land resources and agriculture in Beijing. He says central government officials are frustrated with local corruption and the lack of rule of law in the countryside; he says they know if they don't fix the problem, there will be more unrest. "They are very concerned," Yu says. China's top leaders are expected to hold a crucial meeting in November to plot the future of the nation's economy. The agenda includes an audacious plan to move 250 million farmers into cities over the next dozen years that, if poorly implemented, could wreak havoc. To avoid that, Yu thinks the government will strengthen compensation and farmers' land rights. "I'm quite optimistic," he says. "For instance, farmers in the future could get 10 times the current compensation. It really depends on the political will and determination of the top leadership." Even if those changes come, it may be too late for He Mengqing, who is still in a coma in a hospital in Hunan province, according to his brother. He's family members understand why the local government wants to develop the area and improve the economy. They even support the idea. He's brother, Waiqing, just objects to how it's done. "They're too powerful," he says, his eyes tearing up, his voice catching in his throat. "We have no way to stop them. If they're really determined to do it, I can only watch them destroy our homes." "This type of blind development has no consideration for ordinary people," Waiqing continues. "Our living standard will not go up. On the contrary, it will go down."